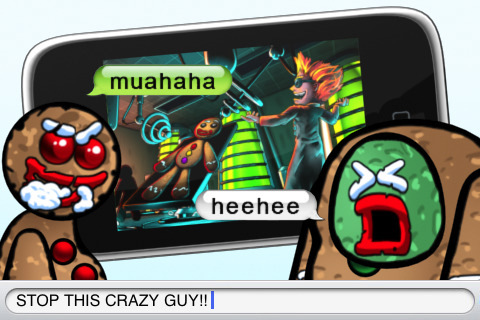 Mmm, gingerbread zombies….. Texting of the Bread takes lovable edible cookies and uses the old Typing of the Dead (spinoff from the House of the Dead shooting arcade game) type-to-shoot style gameplay and turns it into a quirky, intense, and downright challenging typing game. Brought to us by ScrewAttack Entertainment LLC, Texting of the Bread is available on the iPhone, iPod touch, and iPad for $1.99 ($2.99 for iPad). To play the game, type to kill gingerbread zombies. To die, type badly… This is a high production game with a great system for playing. The words you type are usually internet speak so you’ll run across ‘omgwtfbbq’, ‘interwebs’, and ‘lols’ along your journey in 3 immediately available modes: Arcade, Survival, and Freeplay (with two hidden game modes). This is not a boring text learning game though. Texting is not typing, so the challenge comes when there are big long words or a combination of 2 or 3 words with no spaces in between. You’ll get gaming references such as the Angry Video Game Nerd, the Konami code, and even a very clever way of introducing a mini boss or some epic boss battle. A lot of the references, tutorials, warnings, and other things are told through the gingerbread zombies themselves. All and all, extremely entertaining. The graphics are extremely well done. The bread zombies have a large variety of looks and challenges. My favorites are these little mini-bread zombies that only require one letter to destroy. And of course, I absolutely dread the freaky intense boss battle that has you pitted against a gingerbread zombie that’s so large you can only see its legs. The main character has a cow strapped to her back with what I can only call a milk gattling gun. Seriously, they took a theme and made it work excellently. There is even a giant milk wave you can activate when you kill enough zombies by shaking your iDevice. Sounds and music are very well done and the main character will sometimes say something along the lines of “This game is awesome” or “What oven did you crawl out of?” This is a game that has made me smile multiple times in a single play through. Other than that, the sound of a gatling gun shooting milk at gingerbreads is appropriate and doesn’t get too annoying. I loved the Typing of the Dead arcade game when it first came out. It’s been literally years since I’ve seen a game like this. I laughed at the references, I loved the concept, and I love the game play. It’s no surprise that I say that I love this game and it’s barely a few days old at the time of writing this review. I’m serious when I say that this gameplay style should be expanded on. If you graphic swap the game with zombies, if you make it a pseudo-3D FPS, you could have a revival of Typing of the Dead. Hopefully, this will spawn some really interesting games and maybe create a whole new category in the AppStore. If you aren’t familiar with ScrewAttack.com, the AVGN videos, and/or if you hate texting, you might not like this one. Personally, I’ve been waiting for months, checking periodically, for the release of this game. They definitely need a Lite version to let everyone try the game out. Maybe some powerups that allow you to make the words you type shorter or easier to spell? Maybe different weapons that has better stopping power or a gun that allows you to type one long word to kill all the enemies on the screen? There is a lot of potential in a game based around a keyboard. This is a game created by gamers. Excellently done, go strap a cow to your back and start killing those zombies!! AppSafari review of Texting of the Bread was written by Joseph Ho on October 20th, 2010 and categorized under Action, App Store, Featured, Fun, Games, Time Management. Page viewed 4420 times, 1 so far today. Need help on using these apps? Please read the Help Page.